There is a lot more involved in taking care of pet rabbits than most people realize. There are many things that you won’t really find out until you start learning about habitat and nutritional requirements. Seasonal pet tips – especially for bunnies that are kept in the New England region – should be sought out and adhered to, especially winter tips for small pets. Keeping your pet rabbit warm, comfortable, safe and well-fed can be a full-time job, but once you understand their needs, it will all make sense. New rabbit owners should bring their pets in for a check-up at the local animal hospital in Dartmouth. 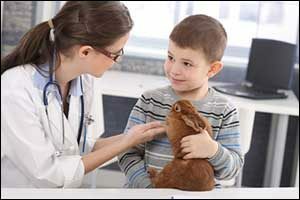 It is important to find a veterinarian that works with your specific type of pet. Adopting a rabbit is a long-term commitment, as they can live upwards of 10 years. Make sure to take some time to do some research about rabbits and their needs before you adopt. And when you do decide to adopt, consider adopting from a local rescue. There are a lot of adorable bunnies looking for homes in your area. Before you even bring home a new rabbit, make sure to have a habitat set up so he or she will feel right at home. The safest place for a rabbit is indoors. Domestic rabbits should never be kept outdoors – especially in the northeastern states. They are much different from wild bunnies and do not tolerate hot summer or cold winter temperatures. There are also risks that come from predators, even for rabbits that are in seemingly safe enclosures. New Bedford pet owners should create an indoor habitat that will meet the needs of their rabbit. You also need to decide whether you want to keep your rabbit in a cage or let it run free around your home. “Free range” bunnies need to have a lot of safety measures put into place. Because they are chewers, all electrical cords and outlets need to be covered or placed out-of-the-way. Chewing cords that are plugged in can be deadly or at least cause serious injuries. It is important to take stock of your home first before allowing your rabbit to run free. If you decide to go with a cage, you need to make sure that there is enough room for the bunny to move around – at least five times the size of the animal. The rabbit should be able to stand up without bumping his heat on the top of the cage and make sure that there is a cardboard floor or other type of flooring material if the cage has a wire bottom. Severe injury can occur to a rabbit’s feet if they are placed on a wife cage. A comfortable “hide” should also be provided. It is important to speak with your vet at the local animal hospital in Dartmouth to find out about the proper requirements for nutrition and feeding that should be used with your exact type of rabbit. Mini lops have different nutritional requirements than French lops, and there are a lot of other breeds that must be considered. The basic rabbit diet should consist of hay, veggies, fruits and treats. However, not all of these foods are created equal. It is important to know the best type of foods for your pet rabbit. Seasonal pet tips may include providing additional foods during the winter or increasing fruits in the summer. The best type of hay for rabbits is known as Timothy grass hay or simply Timothy hay. Make sure to provide a constant supply of hay to aid in digestion and prevent certain health problems from occurring. Alfalfa hay is another type of hay often given to adult rabbits, but it should only be given in limited amounts. It is very high in calories and also provides protein and calcium. Speak with your veterinarian about adding veggies to your rabbit’s diet. Dark green veggies, such as parsley, cilantro, leaf lettuce, arugula, dandelion greens and endive are good choices. They need a variety, so it is a good idea to feed three different veggies at a time. However, when starting new veggies, feed one type at a time to see how your rabbit does with the new food. Fruits are also important and can be given as treats. Apples that have the stems and seeds removed are a good choice, as are blueberries, strawberries, plums, melons, pears and peaches. You can offer sugary fruits like grapes and bananas, but only sparingly as a rare treat. Also, while we see rabbits eating carrots all the time on TV and in the movies, the truth is that carrots are very starchy and should be reserved as a special treat and not an everyday food. Clean, fresh water should always be provided to ensure proper hydration. Many of the foods that rabbits eat can cause dehydration. Choose from water bottles or bowls, but just make sure that your rabbit can’t knock over the water when you are not around. Make sure to change the water at least once each day. Some foods can be harmful to rabbits, including chocolate, candy or processed human foods. other foods should be avoided, as they can have an adverse affect on rabbits or just don’t provide enough nutritional content. These foods include beans, potatoes, cabbage, iceberg lettuce, tomatoes, bamboo, seeds, grains, onions and corn. Speak with your veterinarian and ask about summer and winter feeding tips for small pets that you can use to help keep your rabbit healthy all year-long. New Bedford pet owners who are looking for a local veterinarian, should contact Anchor Animal Hospital in Dartmouth to schedule an appointment. Give us a call at 508-996-3731. We provide veterinary services for cats, dogs, rabbits and pocket pets.